There are 3 neutral (common) wires marked 1, 2 and 3 which are all the old cloth wrapped wires, and a white wire. All neural wires 1, 3x wire 3 and white wire from the light switch and white wire from the timer switch are connected. A dimmer switch for indoor light and a timer switch for outdoor light are connected in series, the dimmer switch to the hot wire 4, and the another black wire from the dimmer switch goes to the timer switch. The white wire from the timer switch is connected to all the neutral wires (total 5 wires), and the blue wire of the timer switch is connected to the wire 1 which is also neutral. There is a neutral wire marked 2 that is not connected. Currently the dimmer switch controls the timer switch. 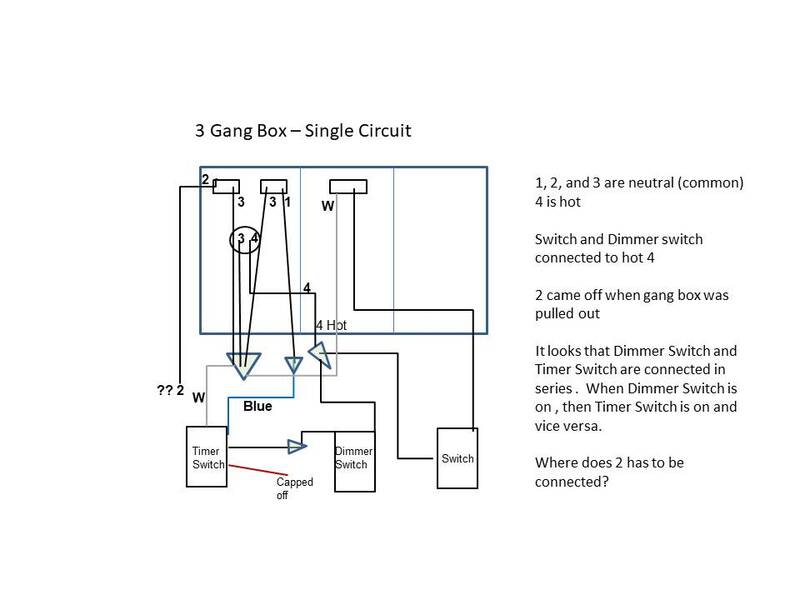 Where do I have to connect the wire 2 in order to make the serial connection of timer and dimmer switch into a parallel connection? In a gangbox with switches on two different circuits, how can I identify which neutrals are associated with which circuit? Can I wire 3 switches to 3 devices through conduit with a single hot and ground? how to wire a light with only 2 wires available?